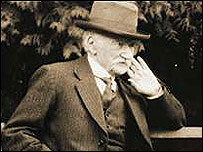 A stained-glass window marking the author Thomas Hardy's links to Cornwall will be dedicated in a ceremony on Saturday. The window has been installed at St Juliot Church at Boscastle, near Tintagel, in the parish where the novelist met his first wife Emma Gifford while working on the restoration of the church in 1870. The £8,400 window was commissioned by the Thomas Hardy Society to commemorate the writer who died in 1928. 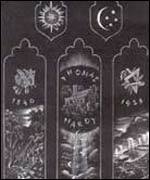 Its central pane contains a countryside image which symbolises Hardy's journey from Dorset to Cornwall. It also contains lines from his poem, When I Set Out From Lyonnesse. Eminent Hardy scholar James Gibson is to lead a series of poetry and prose readings before the dedication ceremony. "This is a very significant event because at last we have a lasting memorial dedicated to Thomas Hardy's connections with Cornwall," said Furse Swann, Chairman of the Hardy Society. The Bishop of Truro, the Right Reverend William Ind, will lead Saturday's ceremony.